The Chamber of Speech is mentioned several times in surviving histories of Kaleth, though only in passing. The scrolls Jedi Knight Do Zonn obtained suggest the chamber was a repository of knowledge in some form, and reference a mysterious being who was master of the chamber's lore. Attempts to fully examine the old machines in the Chamber of Speech have proved fruitless, as the battle droids that guard the ruin are particularly violent. There is evidence that the droids were programmed to return to the chamber if its other defenses failed. Whatever secrets the chamber hides, the ancients of Kaleth were careful to protect them. The primitive Flesh Raiders have turned the once-lush mountains of Tythos Ridge into a horrific camp from which to launch their raids on the other denizens of Tython. The ground is black and barren; the trees and foliage burned away. The air is thick with the stench of death, and piles of bones desecrate ancient Tythonian pillars, mute testament to the countless victims of the Flesh Raiders' appetites. Tythos Ridge was never fully studied during the early stages of Tython's Jedi reoccupation; Master Bestros proposed its use as a meditation retreat, but since then, the increasing number of Flesh Raiders has made exploration impossible. It is unclear whether a small Flesh Raider village was the seed for this now-vast settlement, or whether the Flesh Raiders migrated to the ridge en masse--but either way, for Jedi Masters seeking to understand the creatures, further reconnaissance of the ridge is an absolute necessity. Since the destruction of the original temple during the Sacking of Coruscant, the Jedi Temple on Tython has become the spiritual home and sanctuary of the Jedi Order. Housing meditation rooms, lecture theaters and the Jedi Archives, the temple's architecture was deliberately changed from the original on Coruscant, in line with the Jedi philosophy of non-attachment. The new design is intended to echo the style of Alderaan's famous castles and to evoke the Jedi virtues of humility, serenity and patience. Construction began a year after the Jedi made a permanent settlement on Tython and took three years to complete using local Tythonian stone and timber. The temple's site, built upon the ruins of a much older temple, was chosen by the Jedi Council after a week of fasting and meditation. While the temple's formidable technological defenses are concealed and integrated into the architecture, it's the presence of the Council and the Jedi who train there who truly ensure its safety from invaders. Named after an old Twi'lek word for "beginning," Kalikori village is a settlement in the Tythonian hills, founded by a group of Twi'lek Pilgrims fleeing persecution. The Pilgrims asked the Republic for permission to settle on Tython but were refused; defying the ruling, the Pilgrims founded a small camp that gradually grew into Kalikori village. The village Matriarch's home is built on the site of the original landing. Kalikori is technically an illegal settlement, without protection under Republic law. As the village grew, boasting fertile fields and its own irrigation system, the Twi'lek Pilgrims realized they were expanding into Flesh Raider territory and have been fighting off the creatures ever since without outside help. Despite the anger of the villagers at the Jedi who have "abandoned" them, many Padawans travel to Kalikori village to seek the Matriarch's blessing or to learn about the Pilgrims' teachings. Crumbling walls and rubble are all that remain of the fortified city of Kaleth. Carvings at Kaleth suggest the site has been inhabited and abandoned more than once over the millennia--but always by Force users. This has given rise to dozens of theories about Kaleth from scholars at the Jedi Temple, not to mention interest from archaeologists seeking artifacts of the ancient Jedi. Unfortunately, exploration of Kaleth is hampered by ancient hostile droids that still roam the ruins. The presence of these droids, the discovery of surviving computers and reports of strange lights at night prove Kaleth still has sections with functioning power despite being abandoned for centuries. Because of this, some members of the first expedition to Tython recommended restoring Kaleth and making it the new settlement of the Jedi Order. The Jedi Council decided against this, however, preferring to study Kaleth and its history from a distance. Since the rebuilding of the temple, the very best of the young Jedi have braved the paths through the mountains, hoping to make their first lightsabers at the monument known as the Forge--the ancient Tythonians' site for creating or mending weapons. When the Jedi returned to Tython, they had only scraps of information on the Forge's location; it took ten months before a small team finally discovered it, overgrown by vines and half-buried by a landslide. 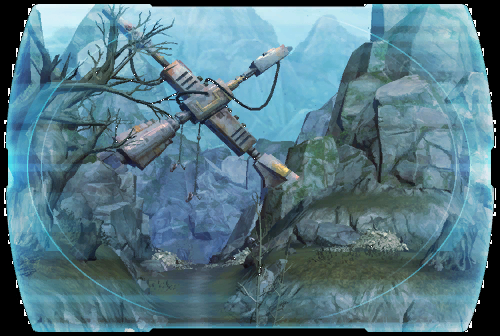 Despite the Forge's power, many Jedi have sensed a strange darkness or corruption in the region surrounding the Forge. The local beasts are unusually vicious, and the weather often changes without warning. These phenomena mean only the most skilled and combat-ready Padawans are encouraged to seek out the Forge. "The Gnarls" is a name given to the wilds near the outpost and landing pads beneath the Masters' Retreat. It was nicknamed for the thick undergrowth that originally covered the region, which took several months to clear. The original explorers of Tython discovered and restored ruined stone paths and bridges leading through the Gnarls, suggesting these wilds were once used by the ancient Jedi. Although still a proving ground for Jedi Padawans, in recent years the Gnarls has become increasingly dangerous. Wild animals have begun migrating closer to the Gnarls outpost, and there have been sightings of Tython's native Flesh Raiders in neighboring sectors. The Jedi Council is in discussions about moving the training grounds to a safer region, but many Masters feel that risk is necessary at a certain level of tutelage; the galaxy is dangerous, and Jedi can't be shielded forever if they're to be prepared. The mysterious Deep Core world of Tython is the birthplace of the Jedi Order. Millennia ago, Tythonian warriors and scholars developed a unique mystic and martial philosophy while studying the Force. Today, their Jedi descendants excavate ancient Tythonian ruins and relearn what was lost. After the recent destruction of the Jedi Temple on Coruscant, the Jedi made their new home on Tython. The mountainous planet remains mostly unexplored, and the violent natives pose a constant threat. The order remains committed to rebuilding here, however, and is now training a new generation of Padawans.